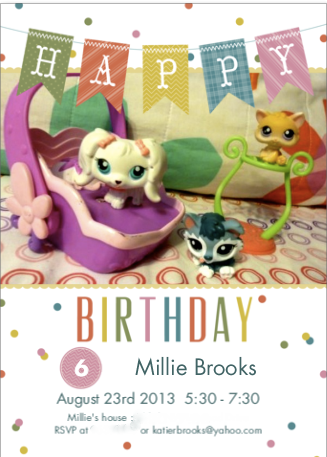 une autre mère: A year later... Millie's Littlest Pet Shop Party! Yikes! Can't believe I haven't touched this ol' blog in almost a year! But nothing brings me back to the blog like birthday parties... Will I post again after birthday season is over? I do not know. But for now, let's just enjoy the highlights from Millie's 6th birthday party. This was the year for Millie's "small" party, since last year was her big Rainbow Unicorn Party. I originally intended for their "small" parties to be something like having one friend over, getting pizza, watching a movie, etc. No invitations, no decorations, no THEMES. However, last year was Addie's "off" year (since the year before was her big Wizard of Oz party) and I made the mistake of letting her do a theme. Bad idea... give this party-lovin' mama a theme and suddenly, I can't. stop. party. planning! So, since I let Addie's "small" party last year be a Dolphin party with 3 friends, I had to let Millie's "off" year include a themed party with a few friends too, right? I don't want to be labeled "unfair." But I SWEAR, from now on, the "off" year parties will just be 1 friend and pizza! I will not allow them to give me a theme. That is just way too dangerous. Enough, I say! Millie decided she wanted a Littlest Pet Shop party. Hmmm... I really don't like commercialized character parties. But she insisted, so I obliged. Plus, I thought maybe it would help limit my instincts to go all out since I wasn't as into the idea. And it did help. I really didn't do as much for this one. But I still thought it turned out rather cute. Every party starts with an invitation, right? Instead of buying the store-bought version (which wasn't very cute), I had Millie set up a little scene with some of her Littlest Pet Shop guys and we snapped a picture. I used Walmart's photo shop to make these invitations. Easy, cheap and personal! The party was on a Friday night, so we started with pizza. See, I didn't even do themed food! This was easy peasy and the girls loved it! After dinner, we headed into the dining room where the Adoption Center was set up. Millie had helped me earlier by setting out all her Littlest Pet Shop characters. I bought 3 new ones that needed loving homes, so Millie's guests could adopt them (an idea I saw on this blog). After adopting their pets, we gathered around the table to decorate homes for them (another idea I stole from the above-mentioned blog - she had great ideas!). The little boxes were in the wedding-favor section of the Dollar Tree, 12 for $1! So we added gems, foam decorations and had ourselves some cute little homes for our pets! After our houses were made, it was cupcake time! These are just some of the dozen I made (this is actually a pic from our little celebration with her tonight, I forgot to get a pic of them at the party!). Everyone got to pick their own cupcake topper. Blow out the candles, Millie! There really are 6 there... one is just hiding. Finally, it was present time! She got some really nice gifts and loved them all! Addie and Tate used their own money to buy Millie this Littlest Pet Shop roller coaster (notice the Target clearance sticker of course!). Addie actually asked for extra chores to do to earn money to buy her brother and sister nice birthday gifts. What a sweetie. There was a little time left before the parents came, so they used their time wisely and played hard! All in all, I'd say this little party turned out quite well! Millie loved it and had a ton of fun with her little group of friends. Soon I'll be posting pics of our little family celebrations for Tate's and Millie's birthdays (Tate's was Saturday, Millie's was today!). 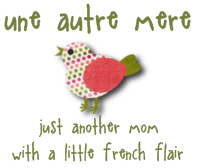 Adeline's is next week, but we're putting off her party until a few weeks later. I think it'll be a fun one! What a super fun party! You have the sweetest kids ever! I love all of their creative ideas and the sparkle in their eyes as they enjoy every minute of it!